And to celebrate I’m going with one of my favourite topics! The Labyrinth!!! Since I can’t reproduce all the movie here for you, I’ve decided to write a “did you know that…?” kind of post. WARNING: if you’ve never seen this movie I could spoil you some things, so please jump at the mark * at the end. …”she” is Jennifer Connelly, and she was only 14 and super super gorgeous already? …the soundtrack is almost entirely by David Bowie, aka Jareth the gobling king, a-to-the-mazing? …there is no computer-graphics involved, it was all made with robots, puppets and costumes? …the worm, in the italian version, has a french accent, and all the other creatures have quirky voices, not different english accents? …the stair scene is based on Escher’s drawings? …Toby is Froud’s son, and is really named Toby? …it’s a modern fairy tale? I mean, at least she’s not one of those sappy princesses that need a kiss from prince charming to be rescued: she’s a teenager, she screws something up and she has to grow to make things up, and doesn’t fall for a charming yet cruel goblin king… though, to be honest, with a goblin king like that and his “forget the baby”, given my non-existent maternal instinct, I would have gone for it quite happily! …the labyrinth itself has really old history and meaning (starting from labyrinths from five thousand years ago, to modern garden or lunapark labyrinths, they are still amusing), usually they are a geometric design with an inextricable path… and the point is to get to the center and then exit it again. It’s easy to understand that it’s a symbol for an initiating journey, or using more modern words, therefore more psycological instead of alchemic, a path for becoming, the path of life. Oh I’m so deep! And did you know that the word labyrinth comes from the greek (or so it seems) lebheris, hare? …the ball scene in the crystal ball (no pun intended) is the only one with real people? …I think it’s a logical/philosophical movie? It may sound silly, but think of Hoggle: he’s not giving Sarah any right answer untill she asks him the right questions; she’s giving everything for granted, she can ask to just one of the four creatures at the doors; she can talk with doorknobs, yet one can answer but not hear, the other one can hear but it can’t talk; the creatures that spin the tiles; Jareth speeds up the time ’cause she said “it’s a piece of cake”; the solution to the “vow” made by Sir Dydimus; the useless answer from the Wiseman; Sarah’s closing lines; Jareth’s promise (“do as I say, and I’ll be your slave”… it sounds strange, but it has it’s own logic)… wow, I could have written a thesis on this!!! Ok, I’m stopping here, it’s better! And now I feel like watching it again! What about you, have you seen it? Did you like it? Are you happy now whenever you see a labyrinth, soap bubbles, striped pajamas, crystal globes, Bowie’s songs and thirteen hour clocks? Show yourselves! You’re not alone! 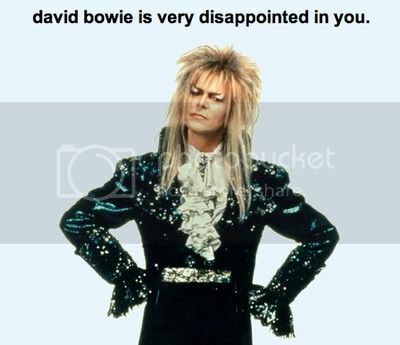 * You’ve never seen The Labyrinth? Let me rephrase. 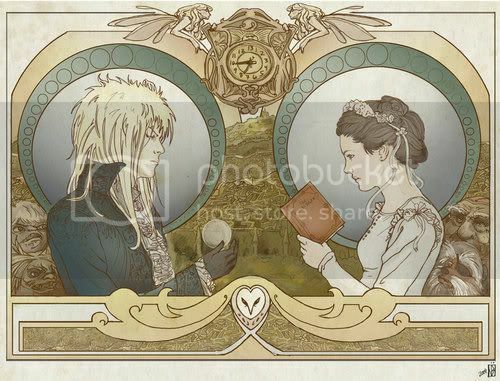 YOU HAVE * N E V E R * SEEN THE LABYRINTH? And what the heck are you still waitin for, you’re still here??? I bloody LOVE the Labyrinth, every single thing about it. (I'm Jim Henson Obsessed!) It is such a unique film, it just warms my heart whenever I watch it. Plus I fully intend to dress my future children up in red stripy babysuits! That ball is perhaps my ideal party. Sono contenta ti sia piaciuto il post, e sono sempre contenta quando incrocio fan di Labyrinth! Ti aiuto volentieri se posso, ma mandami una mail (eeuforilla @ gmail . com sì, ha le due e, e leva gli spazi, non si sa mai ma specifico :P) se no non so come fare! ciao!!! Sono una vera appassionata di Bowie e dei suoi film! Il libro io l’avevo trovato per puro c…aso in una libreria che rivendeva anche libri usati, non credo sia più in stampa… Puoi provare anche tu a vedere se nelle librerie dell’usato o su internet qualcuno lo rivende. Questo penso sia il manga! Del manga ho i primi due numeri, non è male! Ovviamente va letto pensando che è una sorta di fan fiction, però non è affatto male sul serio! Grazie per i complimenti buba! Adoro Labirynth! Hai scritto cose molto interessanti, aggiungo che nei ritagli di giornale appesi in camera da Sara vediamo la sua vera madre, che era un attrice, con Bowie, pare l’amante della donna e il prototipo di ideale maschile della ragazza. Hai ragione anche per quanto riguarda i ritagli di giornale, su quello che si trova in camera di Sarah all’inizio del film se ne potrebbero dire di ogni! Mamma Mia Che ricordi! Avevo 10 anni… E con la mia migliore amica e compagna di classe di allora durante l’intervallo facevano la “recita” del film coinvolgendo tutta la classe e le maestre facevano da pubblico. Poi ci eravamo ripromesse “quando saremo più grandi e avremo i soldi ci compriamo il videoregistratore e il film ” e poi ci chiedevano “e se litigheremo e ci perderemo di vista? A chi rimarranno delle due”? Credo di averlo visto almeno 80 volte senza esagerare, naturalmente ho anche il libro e la colonna sonora sia su Lp che cd che in formato digitale… Un film fantastico e pieno di allegorie, complimenti per il post! Un abbraccio Manu ps mi piacerebbe davvero sapere l’intera analisi che tu hai fatto grazie! L’analisi si *potrebbe* fare, non l’ho mai fatta… ma effettivamente sarebbe divertente, potrei mettermici sul serio! Ci sono tante immagini del dietro le quinte!